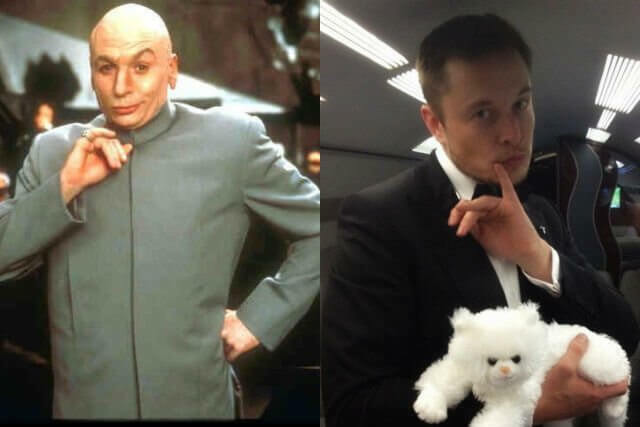 So Tesla’s in the news again, but this time for all the right reasons. 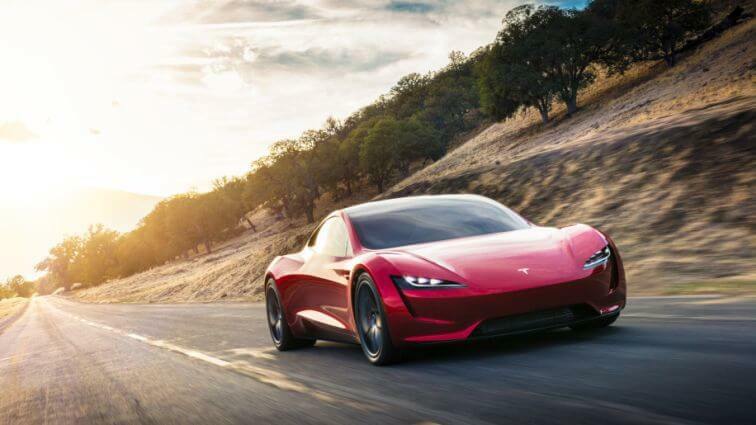 Elon Musk, CEO of Tesla has announced the new Tesla 2020 Roadster. To start, it looks magnificent, futuristic, yet still familiar, with much of it’s design borrowed from the existing super car world, with a body sculpted in a wind tunnel for minimal wind resistance and the most that current aerodynamic technology can deliver. The interior features a massive touch screen center panel like the rest of Tesla’s lineup, and many carbon fibers as you would expect in any modern speedster. The front row bucket seats are basically slightly more padded racing seats, but that’s fine, you’re going to need them. There is certainly sufficient legroom in the front, but if you’re over 6 feet, you’re going to want to keep the removable glass roof in the trunk. Tesla claims it’s the first super car with seating for 4, I’m just not sure 4 of what? In the back row you could probably fit a couple bags of groceries or your short friend Steve who lost his legs in a horrific table tennis accident. Poor Steve won’t have too much to look at though, as the view from the back is nearly non-existent. 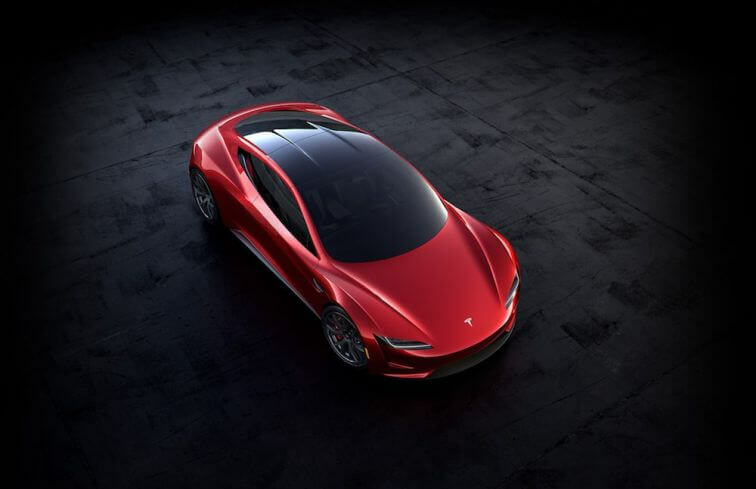 The new Tesla Roadster is pricing at $200,000 USD so is far beyond most of our reach, but if you’ve got some stacks hidden under your bed or feel like remortgaging your house, you can reserve yours today for the paltry sum of $50,000. Or you can reserve the “Founders Series” by purchasing it up front for a cool quarter mil. Not really sure what the “Founders Series” entails, but it’s a limited run of 1000 cars, and probably comes with an 8-ball of coke and a lap dance from Musk himself. Elon Musk has said this is the world’s fastest production car, and you know what, I think he’s right. They’re claiming a 0-60mph time of 1.9s in what was dubbed “Plaid” mode by Musk several years ago. Sorry Dodge Challenger SRT Demon, your claim to fame was pretty short lived, your 0-60 time of 2.3 is now glacially slow. For shame you heap of welded together pig iron. 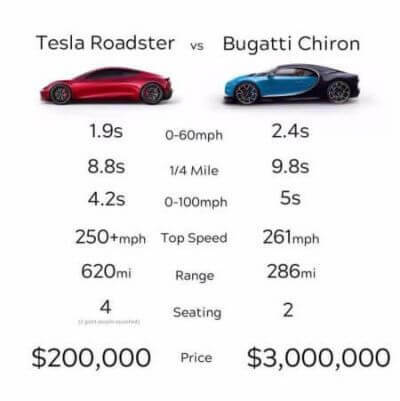 There’s even a fun little meme floating around redditt highlighting how the Tesla Roadster crushes the great Bugatti Chiron at every turn for a fraction of the cost. Some lucky SoB at the Silicon Valley style unveiling with $50k to burn managed to get his hands on one and filmed the Tesla Roadster’s unreal Plaid mode, the results were…. see for yourself. I mean… I thought I knew fast before, but that 1.9s is… shocking, and almost a little spooky in the Tesla. There is no 1000hp v8 grunting fire and brimstone causing hearing damage throughout the neighborhood, no super fat soft compound strip tires deforming under the extreme torque then coming loose in a scream of melting rubber, just a tiny bit of tire chirp as a brilliant all wheel drive system locks down the claimed 10,000 nm of torque output by the 3 motors then proceeds to peel the skin off of your face. That’s another thing, 10,000nm of torque. That’s 7375 ft/lb of torque for the rest of us gearheads who have no idea what a “Newton Meter” is. Let that sink in. That’s earth moving. Compare that to the Lamborghini Huracan with an output of 610hp and a measly 410 ft/lb of torque, or the big Bugatti Chiron with it’s whole stable of 1600 horses and a slightly more respectable 1160 ft/lb of available torque. Frankly, I’m glad it’s Tesla who has built something this over the top quick, because they’ll also have the technology in place to keep the driver from killing themselves and a crosswalk full of children any time they think it’s a good idea to show off. Musk had also pointed out in a tweet that the 0-60 in 1.9s time was for their BASE model, and that we can expect something even more spectacular in the future much like the P100D and ludicrous mode. 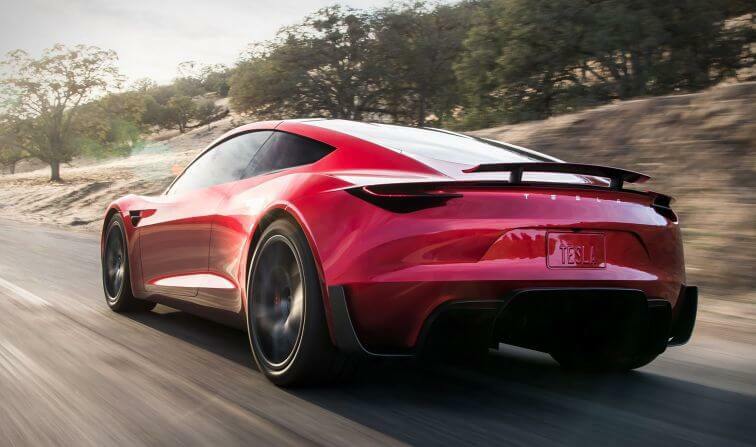 In another tweet he’s alluded to the roadster being able to “fly” in short hops when spaceX’s rocket technology is applied on future iterations of the car. I’ll hold out on hoping they actually build it around a rocket engine a la the 1990’s batmobile, but a man can dream.